TUNE IN TODAY! $100,000 President's Cup Grand Prix on TV at NBC Sports Network! 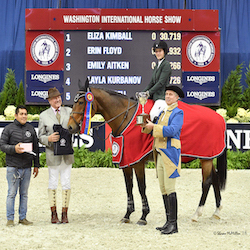 The $100,000 President's Cup Grand Prix, presented by Events DC, is a highlight of the 54th Annual Washington International Horse Show held at Verizon Center in downtown Washington, DC, an FEI World Cup Qualifier event. Sunday, October 28 at 3:30 pm EST$100,000 President's Cup Grand Prix and Washington International Horse Show will be aired on NBC Sports Network at 3:30 p.m. EST. The class will host 28 of the world's best show jumpers, including Beezie Madden, Laura Kraut, Lauren Hough, Kent Farrington, Reed Kessler, and more! Melanie Smith Taylor and Kenny Rice will be the on-air talent for NBC Sports Network. Tune in or set your DVRs to NBC Sports Network Sunday, October 28 to see the produced coverage on WIHS and the grand prix! Visit http://nbcsports.msnbc.com/ to find NBC Sports Network in your area.